We have previously shown that inflammatory cytokines are up-regulated in chondrocytes of osteoarthritis (OA) patients. However, the inflammatory responses associated with OA are still ill defined. To investigate in more detail the involvement of the immune system in the pathogenesis of OA, we here analyzed patients for the presence of autoantibodies. Both sera and synovial fluids obtained from 85 OA patients at the time of joint replacement were tested for autoreactivity. Autoantibodies reacting against synovial membranes were detected performing immunofluorescence on cryosections. Autoantibodies recognizing lysate components of various cell lines (B-cell, T-cell, monocyte, fibroblast and chondrosarcoma) were shown by the use of Western blot analyses. In preparation for the identification of the respective autoantigens, we started to immunoprecipitate the proteins of interest. Sera from the OA patients reacted strongly with cells in the synovial membranes whereas sera obtained from healthy donors did not (Fig. 1). Furthermore, about 50% of the OA sera and none of the control or RA sera reacted very strongly against lysate components of the different cell lines tested. The corresponding synovial fluids reacted against the same lysate components, but the signals obtained were of reduced intensity. 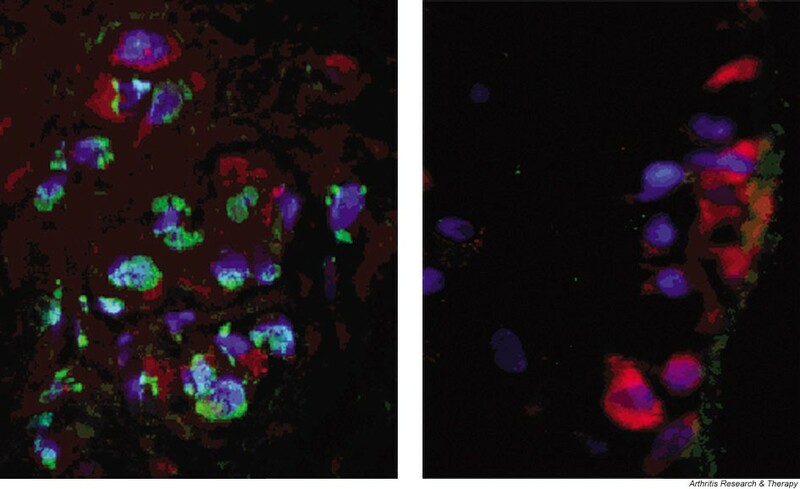 Immunofluorescence reveals the presence of autoantibodies in OA sera. Cryosections of synovial membranes were incubated with control (A) or OA (B) sera. The binding of autoantibodies was detected via FITC-labeled anti human IgG antibodies (green). Fibroblasts were stained with the specific antibody (5B5) and developed via SA-rhodamine (red). Nuclei are counterstained using DAPI (blue). Our results demonstrate the presence of autoantibodies in sera and synovial fluid in about half the OA patients. The specificities of these autoantibodies are not restricted to the joints, as reactivity was detected towards any cell line tested. Hoping to design new diagnostic tools and to shed light on the role of autoantibodies in the development and progression of OA, we are in the process of identifying the corresponding autoantigens.